After literally decades of production, patient Tolkien fans finally have a complete six film saga with the Hobbit and Lord of the Rings trilogies both at last complete. The Battle of The Five Armies is a satisfying final piece of that vast fantasy adventure, delivering the usual mix of CGI wizardry and shamelessly epic storytelling. Those that found the earlier Hobbit films lacking in pace will be pleased to see the final chapter open with a spectacular action sequence. As the wicked dragon Smaug brings down fiery death and destruction on the poor inhabitants of middle earth. From this literally explosive beginning, the film moves quickly, pulling together now familiar faces from the entire saga to give fantasy fans and blockbuster crowds the precisely promised climactic battle. The near constant fighting in this film equals the technically high standards of the previous films, but offers enough new adversaries and memorable moments to distinguish it beyond simply repeating successful CGI formulas. The returning cast including firm fan favourites like Sir Ian McKellan’s Gandalf and Orlando Bloom as princely elf warrior Legolas each deliver excellent performances with effortless ease. Sherlock star Martin Freeman remains perfectly typecast as unlikely hero Bilbo Baggins and Evangeline Lilly is suitably enchanting as elf heroine Tauriel. Richard Armitage also has a chance to flex some dramatic muscles between wielding his sword in battle, as Thorin confronts his inner demons. Those who failed to feel the magic of Peter Jackson previous middle earth epics are perhaps unlikely to suddenly discover it here. Jackson’s impressively crafted battle scenes will not win over those uninspired by whimsical adventures so absolutely detached from real life. Likewise those left numb by the franchises notoriously long running times will likely still find the film’s comparatively trimmed down 144minutes a little daunting. If you lack patience or an appetite for the fantasy genre then this won’t be an easy ride. In particular those already watching the clock may find that interrupting the action for frequent slow motion reaction shots and expositional dialogue leaves them more frustrated than emotional. Being perhaps overly cynical it’s noticeably convenient just how often characters manage to have friendly chats, bickering arguments or exchange lingering gazes in the midst of war torn battlefields. Though the film has poignant conclusions to a number of character arcs, it feels obliged to include occasional instances of heavy handed but ineffective humour. Weasley coward Alfrid played by Ryan Gage is guilty of most of this. As with the Lord of the Rings it simply feels like the film would have been a shorter more compelling adventure without these pointless moments of attempted levity. That being said the film does similarly find time to wade through lengthy melodrama, as clearly heroic characters like Dwarf leader Thorin, battle greed and paranoia long before they ever draw swords with an actual enemy. Though these struggles all play out in the context of a wider saga and expansive journeys for the various characters, the corrupting madness of power is an all too familiar theme for this franchise. Though the film boasts largely impressive special effects there are occasional moments where less convincing CGI proves distracting. Legolas unbelievably defying the laws of gravity even more than usual is a specific example of this. Without ignoring the amazing digital achievements and artistry behind the film, the sheer scale of the action means it sometimes lacks the tactile credibility of practical effects. The Hobbit trilogy has stood on the impressive shoulders of the cinematic Lord of the Rings saga which preceded it, to at least match its technical brilliance. 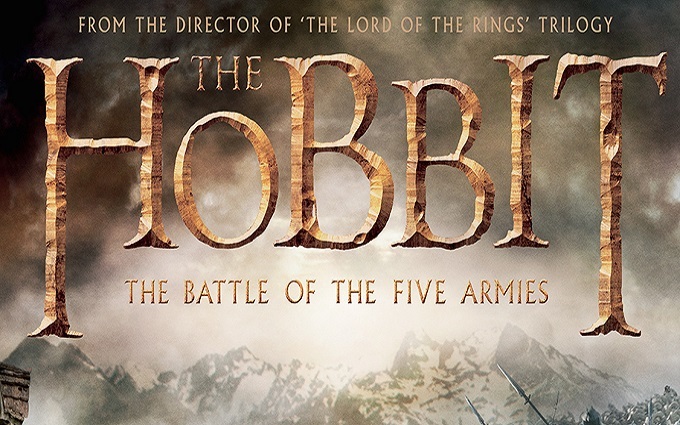 This action packed final chapter will delight devoted Tolkien fans and casual blockbuster crowds equally. The series violent conclusion is propelled with a sense of urgency towards an undeniably satisfactory finale. Jackson gives fans a must see middle earth adventure, possibly for one last time.